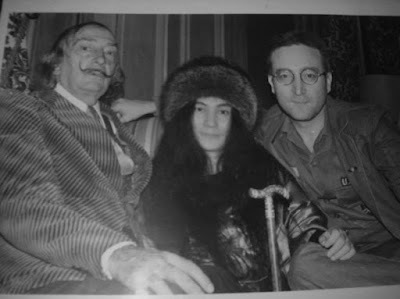 Seriously though---who is the man with Yoko and John? When and where was this taken? It's the artist, Salvador Dali. They famously met in March, 1969, and since John is clean shaven this is an image from a later meeting in the 1970s. I was thinking it was from 1975 or 1976. That's Salvador Dali, but I don't know the when and where. Well, I guess everyone else paid much more attention to art class than I did! I wouldn't have known what Salvidore Dali looked like in a million years! Thanks all! am I the only person that thinks he looks like a large mayor of the munchkin city??? Judging from his very short hair it has to be circa Feb 1976 as he cut it that short in Jan (seen on his passport photo) but where and why I have no clue. Fascinating photo and one of the rarest in a long time. Update. Seems Elliot Mintz interviewed Dali at the Pierre Hotel in New York and John & Yoko went with him. There are videos on youtube of Elliot recalling the interview. Probably early Feb 1976 but its a rare pic for sure. Even Chip Madinger didn't mention this "encounter" in his brilliant book "Lennonology". I had no idea what he actually looked like. As I said---I took some art classes in college and I remember learning about him, but never in those classes did they show us photos of the artists themselves. How would I have been able to guess who it is was if I had never seen him before?